Two trailers found in Iraq were apparently built to be mobile biological weapons laboratories, U.S. officials tell a newspaper. The report in The New York Times is the first U.S.-confirmed find of any of the prohibited arms that the Bush administration alleged Iraq possessed before the way. A senior military commander says the U.S. will invite a team of international experts to inspect the labs. So far, the United States has chosen to conduct its weapons hunt without help from U.N. inspection teams. 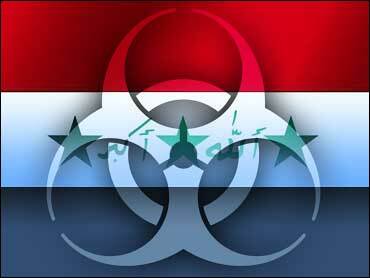 Although the laboratories do not represent proof that Iraq had biological weapons, American officials believe their only purpose was for making such weapons. The Times says U.S. experts eliminated every other possible explanation for the trailers' design and contents. Pentagon officials said troops seized the first trailer at a checkpoint near the northern Iraqi city of Mosul on April 19 and found the second trailer on May 9 at al-Kindi, a former missile research facility in Iraq. No biological agents were found in the labs, which were apparently cleaned with a caustic substance at some point before they were found. It is not clear that the labs were ever used to produce weapons. Some equipment from the latest trailer had been looted, and there were indications such as unfinished welding that the apparatus was incomplete. In making the case for war to the U.N. Security Council on February 5, Secretary of State Colin Powell said Iraq possessed around seven labs comprising 18 trucks. He claimed the labs could produce anthrax and botulinum toxin. It was one of a list of alleged illegal weapons systems and programs that Powell said lurked in Iraq. President Bush cited those alleged illegal weapons as a key reason for attacking Iraq. Saddam Hussein's regime insisted that Iraq had destroyed all its chemical and biological weapons. U.N. weapons inspectors who spent more than three months in Iraq just prior to the war found no evidence to refute the Iraqi claims. To date, U.S. weapons hunters have not uncovered any chemical or biological weapons or conclusive evidence that such programs existed in recent years, despite visits to more than 100 suspected sites since the war began on March 20. Powell told a German interviewer last Friday he believes it's just a matter of time before weapons turn up. "We are flooding it (Iraq) with inspectors, we are flooding it with experts who will look in every place that one can look in to find documents and to get evidence of their programs of weapons of mass destruction. And we're quite sure we'll find it," he said. But Joseph Cirincione, of the Carnegie Endowment for International Peace, said, "It's obvious that the WMD program did not exist on the scale that the administration claimed. If it did, we would have seen it by now." Peter Brookes of the Heritage Foundation said Saddam may simply have decided to hide the armaments or destroy them. "The important thing is that we've eliminated the regime's capacity to use these things," he said. But politically, the administration is eager for firm evidence of Saddam's arsenal because its existence was the main justification for the war, even though polls indicate most Americans would consider the war a success even if no weapons were found. CIA Director George Tenet warned last fall that if the United States attacked Iraq, Saddam might hand off his forbidden weapons to Islamic terrorists for a counterattack. Some analysts say that scenario cannot be ruled out now that that 60 days of searches have produced scant evidence doomsday weapons. That feared proliferation could also occur as a result of looting. The International Atomic Energy Agency has made specific requests to inspect Iraq's largest nuclear facility, where looters may have gained access to potential dirty bomb material when the site was left unguarded for days. Some 20 percent of the known radioactive materials stored at the Tuwaitha nuclear complex are unaccounted for, and U.S. nuclear experts have found radioactive patches on the ground where looters dumped out barrels believed to contain hazardous materials. The Iraqis had been using the dormant plant to store declared nuclear materials that were prohibited and sealed by the U.N. nuclear agency. The IAEA was monitoring 2 tons of enriched uranium and several tons of natural and depleted uranium stored at Tuwaitha. Enriched uranium is a key ingredient in nuclear weapons. While the sprawling complex was considered one of the top sites where evidence of weapons of mass destruction might be found, it was left unguarded for days during the war. Reporters saw villagers removing storage barrels and dumping out contents matching the description of uranium oxide. By the time U.S. weapons teams showed up to inspect the facility, so much had been destroyed that it was impossible to know what was missing. A nuclear assessment team, which began a survey of the site Monday, has managed to track what remains of materials that had been monitored by the IAEA. The IAEA has been sharply critical of the U.S. handling of the site. Defense Secretary Donald Rumsfeld said Tuesday he would be willing to let members of the IAEA back into Iraq to assist them at nuclear sites. He couldn't say when or how.